or any other way you can think. Roses are slowly showing their beautiful fragrant blossoms again for the season. I would be hard pressed to find anyone that isn’t entranced by their beauty and scent. I’m posting this recipe now so you will be prepared for the season when the hips are ready for use. It’s always good to “mentally mark” where forage plants are growing so you can return when they’re ready for use. Rosa rugosa hips, almost ready to harvest. I have used petals several times in the past to make liqueurs. The resulting liquid’s flavour and colour is entirely dependent on the type of rose. I have used two: rugosa rose (here) and Harrison’s Yellow (here). I have a third rose, a white rugosa, which will probably fall victim to my penchant as well. They make a nice liqueur. North America is host to may native species of roses. One of the most common is Rosa virginiana, the beautiful, simple five petal rose. In the village where I grew up they, and another rose, are so common they actually scent the air. It’s wonderful. They’re in my crosshairs for liqueur as well. But rose petals are only one part of the rose that can be foraged for the kitchen/liquor cabinet. 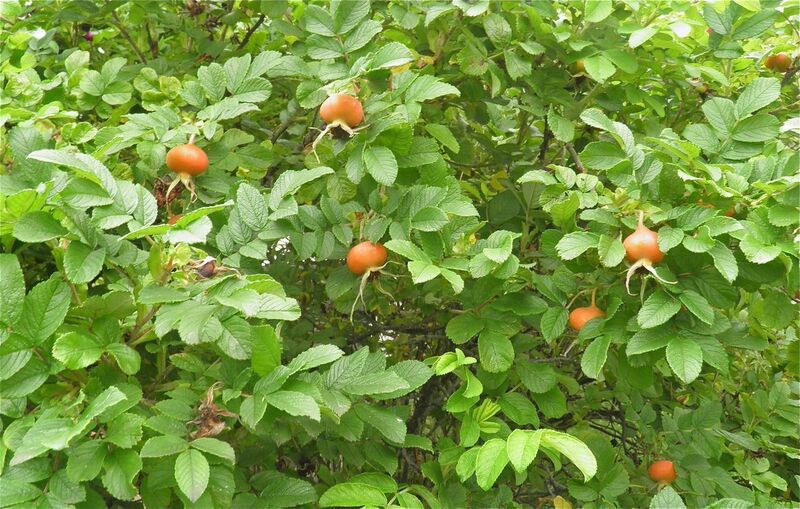 Rose hips have been used as a food source for millennia. The hips are an excellent source of Vitamin C, actually packing more punch than an orange. I have read that three small hips have as much as one regular-sized orange. Preserving (including drying) rose hips for the winter weather provides you with a Vitamin C “bomb” right in your kitchen pantry. Rose hips are used for herbal tea, jam, jelly, soup, pie, wine and marmalade, to name just a few foods. They can also be eaten raw, like a berry, but take care not to eat the “hairy” seeds inside – just the flesh. Today, we’re making syrup. There’s one major caveat when gathering roses. Take care when harvesting to avoid areas that may have been sprayed with pesticides. This is also a good reason to avoid using purchased roses. They’re guaranteed to have been sprayed. 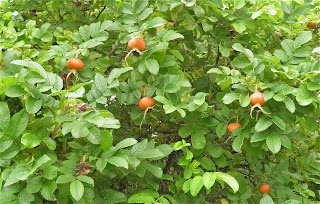 When foraging choose rose hips that have turned bright red and are fully developed. Some people recommend waiting until after a first frost (hopefully a LONG way off yet). I did when I made this last year. 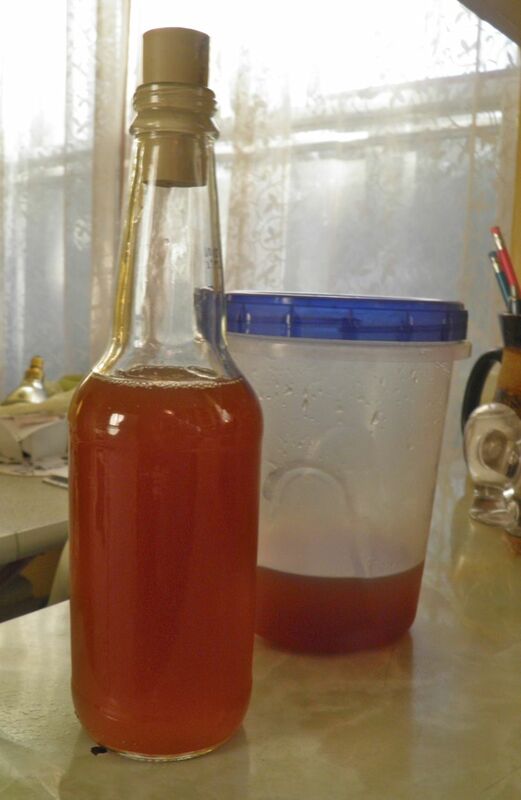 I used rugosa for this recipe, but if you have a source of wild rose hips they would be stellar. 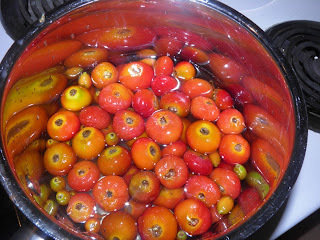 Gather the rose hips, remove the spent flower end with a knife and rinse well. Add the rose hips to the water in a pot. Bring to a boil and let simmer for 20 minutes. Mash the hips as they simmer. After 30 minutes, strain the mixture through fine cloth or a jelly bag. 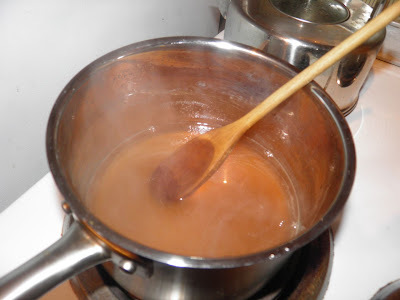 Return the liquid to a clan pan, add the honey and let simmer for a further 10 minutes. It will thicken slightly as it cools. That’s all it takes. You now have a syrup that can be used on pancakes, drizzled on baked goods, as a tea sweetener or any other use you can think of. This syrup must be refrigerated, but will keep for quite a long time.